Cannabis testing regulations continue to be developed and refined as states grapple with how to provide adequate oversight and ensure safety of legalized marijuana. Some states have instituted medical marijuana testing regulations, while others mandate testing for recreational use as well. Other states have no laws regarding cannabis testing yet. Cannabis testing will play an increasingly important role in the business of medical and recreational marijuana cultivation, as the formal regulations come down from state legislators and perhaps, in the future, federal lawmakers. All medical marijuana must be tested in a third-party medical marijuana testing laboratory and reviewed by two medical marijuana treatment center employees before it is dispensed to patients. The laboratory must be an independent third party, with no affiliations to doctors, caregivers, or patients. Laboratory results indicate that the concentration of tetrahydrocannabinol meets potency requirements; the labeling for tetrahydrocannabinol and cannabidiol concentration is accurate; and all marijuana is safe for human consumption and free from harmful contaminants. The maximum levels for each contaminant will be overseen by the Department of Agriculture and Consumer Services. The department may, at times, select random samples from edibles available for purchase in dispensing facilities to test for potency, safety, and labeling accuracy. Medical marijuana treatment centers must pay for their own sample testing and recall any items that do not meet standards for potency, safety, and accurate labeling. Medical marijuana treatment centers must retain records of test results for each homogeneous batch of marijuana dating back at least nine months. Medical marijuana treatment centers must contract with a third party medical marijuana testing lab to perform audits on their standard operating procedures, sampling, and testing records to confirm that the results are pure. Two processed samples from each batch should be retained for at least nine months in case an audit is requested. Furthermore, certified labs can prove there is no conflict of interest with medical marijuana treatment centers. Lab personnel agree that they will not sell, distribute, or otherwise transfer marijuana received from a marijuana treatment center. 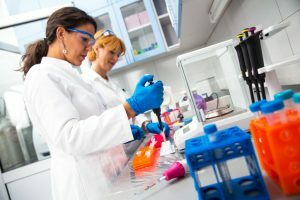 Samples may be transferred to another testing laboratory if the situation warrants, but must otherwise all samples received after the period of storage has elapsed must be properly disposed of. The lab must possess proof of proper accreditation or certification. All owners and managers can pass a level 2 background screening and submit to fingerprinting, as required by the Department of Law Enforcement. All Florida marijuana testing facilities will use a state computer software tracking system that traces marijuana from seed to sale in real-time. In Colorado: New medical and recreational marijuana testing regulations went into effect July 1st, 2016. Testing is required for E. Coli, Salmonella, Yeast, Mold, residual solvents, and filth. THC potency must not vary more than 15 percent of the labeled levels. Potency testing must also include levels of THCA, CBD, CBDA, and CBN. Four samples of each strain must be sent by the cultivator, one week apart, with additional samples tested again once every six months thereafter. Annual validation of process testing for contaminants must be done. Labs undergo proficiency testing to demonstrate knowledge of testing flower potency, and compliance with Colorado Department of Public Health and Environment protocols. In California: Marijuana testing is overseen by the Bureau of Marijuana Control. A new 46-page plan details regulations covering everything from what clothing lab technicians can wear when collecting cannabis samples, to what level of pesticides are considered “safe” in a cannabis sample. According to the proposal, labs will have to test for homogeneity, analytes, cannabinoids, residual solvents, microorganisms, pesticides, heavy metals, mycotoxins (like aflatoxin), water activity and moisture content, and the presence of filth and foreign material. They must report, in milligrams, the concentration of THC, THCA, CBD, CBDA, CBG, and CBN. Samples “pass” if they do not stray from the stated levels by greater than 15 percent. Labs are encouraged, but not mandated, to test for terpenes. Labs must report the presence of acephate, butane, Salmonella, arsenic, and mold. These new rules for medical marijuana testing in laboratories are expected to start in 2018. Modern Canna Science keeps abreast of the emerging guidelines for cannabis testing standards in every state. We’ve been busy securing every possible accreditation that could become the next universal standard. Our Florida laboratory is in compliance with all state statutes and Department of Health regulations. Our testing standards comply with the Medical Cannabis Recreation Safety Act (MCRSA) and the Adult Use of Marijuana Act (AUMA). Pesticides (based on AOAC Official Method 2007.01). Cannabinoids such as THC, THCA, CBD, and CBDA (with extraction methods for edibles). Bacteria and fungi (as specified in state guidelines). Volatile Organic Compounds and residual solvents. Water activity (which indicates support — or lack thereof — for microbial growth). Terpenes (to identify the unique characteristics of the strain). The Modern Canna Science labs are fully equipped with advanced instrumentation for gas chromatography, along with sample derivatization; Flame Ionization Detection; UV detection; ultrasonic extraction; High Resolution Mass Spectrometry; and High Performance Liquid Chromatography (HPLC). Our skilled scientific staff includes chemists with several years of experience specific to analytical chromatography. Contact Modern Canna Science to consult with a high-tech laboratory that is setting the gold standard for medical cannabis quality assurance and control in Florida.